What good is it to have a mea culpa if those officials who imposed such disastrous, inhuman policies remain on board and are, in fact, promoted for their gross incompetence? This week began with a debate in Greek Parliament called by the Official Opposition (the troika’s main, but not only, domestic cheerleaders) for the purposes of, eventually, indicting me for daring to counter the troika while minister of finance in the first six months of 2015. The troika who had staged a bank run before I moved into the ministry, who had threatened me with bank closures three days after I assumed the ministry, and who proceeded to close down our banks, now moved to charge me with… bank closures and capital controls. Like a common bully, the troika proved immensely keen to blame its victims, and to violate and vilify anyone who dares resist its thuggery. My reaction to the troika’s charges, and threat of being pulled up in front of a judicial inquiry , was simple: “Bring it on!” “I shall face you”, I challenged them “in any forum you want: in an amphitheatre, a TV station, even a court room!” In the end, they chickened out and the parliamentary motion was defeated as some of them (a small party usually fully in troika’s clasps) strategically voted against. And then, to complete this week’s drubbing of the troika, the report by the IMF’s Independent Evaluation Office (IEO) saw the light of day. It is a brutal assessment, leaving no room for doubt about the vulgar economics and the gunboat diplomacy employed by the troika. It puts the IMF, the ECB and the Commission in a tight spot: Either restore a modicum of legitimacy by owning up and firing the officials most responsible or do nothing, thus turbocharging the discontent that European citizens feel toward the EU, accelerating the EU’s deconstruction. While I was in the ministry, negotiating with such folks, the troika-friendly (or should I say troika-dependent) press was arguing that I am not fit to conduct these negotiations because I had dared insinuate that, from 2010 to 2014, the IMF, the ECB and the Commission had been fiscally waterboarding Greece, causing an unnecessary Great Depression as a result of their thuggish imposition of macroeconomically incompetent policies. The establishment press were claiming that a finance minister of a small, bankrupt nation which is being waterboarded by the high and mighty troika functionaries cannot afford to say, in public or in private, that his small, bankrupt nation was being waterboarded. My response was that we had tried silence and obedience from 2010 to 2014. The result? A loss of 28% of national income and grapes of wrath that were “…filling and growing heavy, growing heavy for the vintage”. Thus, it was time to put to the troika moderate, rational counter-proposals while refusing to continue to acquiesce to their pretend-and-extend tactics. It was a stance that I was never forgiven for. The question now is: What next? • What good is it to receive a mea culpa if the policies imposed on the Greek government are the same ones that the mea culpa was issued for? • What good is it to have a mea culpa if those officials who imposed such disastrous, inhuman policies remain on board and are, in fact, promoted for their gross incompetence? In sum, an urgent apology is due to the Greek people, not just by the IMF but also by the ECB and the Commission whose officials were egging the IMF on with the fiscal waterboarding of Greece. 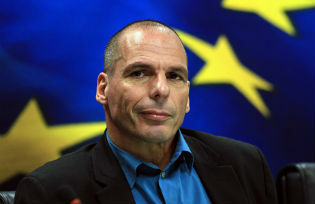 But an apology and a collective mea culpa from the troika is woefully inadequate. It needs to be followed up by the immediate dismissal of at least three functionaries. First on the list is Mr Poul Thomsen – the original IMF Greek Mission Chief whose great failure (according to the IMF’s own reports never before had a mission chief presided over a greater macroeconomic disaster) led to his promotion to the IMF’s European Chief status. A close second spot in this list is Mr Thomas Wieser, the chair of the EuroWorkingGroup who has been part of every policy and every coup that resulted in Greece’s immolation and Europe’s ignominy, hopefully to be joined into retirement by Mr Declan Costello, whose fingerprints are all over the instruments of fiscal waterboarding. And, lastly, a gentleman that my Irish friends know only too well, Mr Klaus Masuch of the ECB. Finally, and most importantly, the apology and the dismissals will count for nothing if they are not followed by a complete U-turn over macroeconomic, fiscal and reform policies for Greece and beyond. Is any of this going to happen? Or will the IMF’s IEO report light up the sky fleetingly, to be forgotten soon? The omens are pointing to the latter. In which case, the EU’s chances of regaining the confidence of its citizens, chances that are already too slim, will run through our leaders’ fingers like thin, white sand.